I'm a big fan of raw food, even though I'm not a vegan or a raw foodie. There are two reasons why I like it: (1) it is healthy since it is not processed at all and is made from foods that occur in nature, and (2) it really fills me up, way more than non-raw foods. I'm not exaggerating about the full thing, I think raw food makes me about twice as full as non-raw food. If I were more disciplined I'd eat it all of the time. 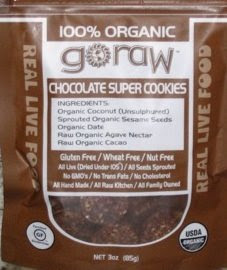 A bit ago I discovered some pretty tasty chocolate flavored raw super cookies made by a company called goraw. The full ingredient list is: organic coconut (unsulphered), sprouted organic sesame seeds, organic date, raw organic agave nectar, and raw organic cocoa. Pretty great list. What I love about the cookies (they are more like sweet crackers in my opinion) is the coconut taste, which goes really well with the chocolate cooca flavoring. The package boasts of the fact that these little round cookies are gluten free, vegan, organic, nut free, etc., which is an added plus if you have diet restrictions. A serving of these very filling cookies is 28 grams (1 ounce), 149 calories, 8 grams of fat (from the coconut) and 4 grams of fiber, making it 3 weight watchers points. The portion could be halved for 1.5 weight watchers points, and the smaller serving of cookies would still constitute a very filling snack. I found the cookies at Whole Foods! I've bought other yummy raw foods at Whole Foods like Huuraw Chips and Lydia's bars. Yum, I'll have to try those! I love Whole Foods! juliet, these look fantastic. i am a big raw food person, myself. i'm actually eating a raw cinnamon roll for breakfast. it's to die for. i try to make a lot of raw foods, but i can't make cookies, crackers, or anything crunchy because i don't have a dehydrator. Hey this blog's really neat! Those raw cookies sound like they have amazing ingredients. These sound great - although, anything chocolate is great!!! I love raw foods too, and I personally think they are so filling because the food is REAL, so there is a lot of fiber in it, plus most raw foods, especially commercially produced ones, need some kind of fat to keep it together, so that makes it more filling also. Just my opinion though, something I have though about myself! Anyway, those cookies look awesome!! I'm a fan of raw stuff too, actually. I really love Larabars, for instance, though they aren't too common around these parts. These cookies look really good...I wonder if they're available in Canada? You must be on a chocolate kick! These look cool! great tip - these sound great. Thanks for another great suggestion. I'm going to pick some up next time I'm at Whole Foods. By the way, I love that you include the shopping info along with your reviews. Thanks! Okay, I know this is way off topic here, but I had to ask. LOL Since you shop at Whole Foods a lot, I figured I may have of you knowing. Firstly, does your store have the Gelato counter? If not you probably wouldn't then. Last week I was in a store that recently opened, and they have a "Gelato Bar". I sampled some of the chocolate flavors, and boyyy was it creamy and delicious! However, I held off on buying any. I am trying to research online the calories in Gelato icecream, but I'm getting sooo many different results it's making me crazy. I did find this site (http://www.meltgelato.com/) which seemed pretty good because they had some of the same flavors like cookies & cream, PB chocolate chunk, something with rum, etc.. But I can't remember if it WAS Melt gelato or a "Whole Foods" brand type. In any case, if you could help me figure this out I would forever be in your debt! The Gelato they serve at my WF is made by Ciao Bella (which you can also buy in the freezer section). This might only be at mine, though, since I believe Ciao Bella is located in San Francisco. With respect to what to count it as, I'd go find 3 gelatos in the freezer and average all of the stats, or just stick with the highest. Better safe than sorry, even if it is hard to imagine eating all of those calories. I also would check out calorieking which is a great calorie resource. I've had these before and they are a yummy treat! GoRaw also makes a delicious banana "bread." If you like sweet, raw goodies, you'll love these simple Holiday Sugar Plums. Mmmm!